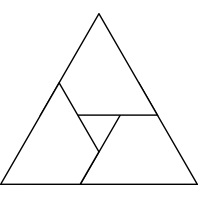 i have developed several apps for the android platform; currently my four apps are all tools for the game runescape (they were developed individually with no contact from the creators of runescape). one of them receives json-encoded data and parses it, while the other two perform web scraping from pages of runescape.com. two of them are paid apps which continue to receive a steady amount of sales and positive feedback daily. in 10th grade, we were given a very open-ended assignment, to complete a project over several months and keep a log of it. this was the outcome of my project: a multiplayer online game. log in with two or more people and you can see each other and talk to each other! i revised it a bit that summer, but abandoned it due to very messy code. my dream now for several years; this online rpg is what i work on in my spare time. it will be my focus through college, and i hope to have it done by the time i graduate (2012). 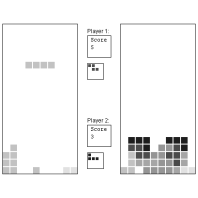 another mini-game, like pong on the front page. 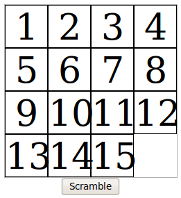 this is a puzzle that i quite enjoy, despite its simplicity. i wrote this one day when i was bored; it only took an hour or two. unfortunately, that was several years ago in late middle school, so it doesn't work in html strict and i can't guarantee that it is cross-browser. 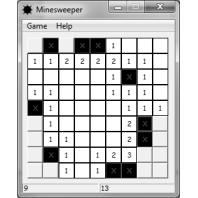 my 10th grade computer programming class assignment; a recreation of the classic minesweeper game found in all versions of windows since windows 3.1.
a two-player "falling blocks" game, a project for computer science class in 12th grade. 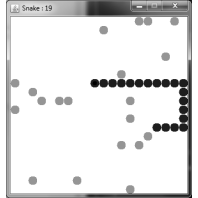 the classic game of snake. use the arrow keys to guide the ever-growing snake to food, and don't let it eat its own tail!